Georgia State freshman D’Marcus Simonds smiles at his fellow teammates during a practice. He’s the program’s biggest high school recruit to ever commit. The four-star combo guard averaged 25 points his senior season, leading Gainesville High School to an undefeated 17-0 record in regional play. He was ranked the 72nd best high school basketball player in the country, simultaneously earning all-state honors a third time in a row. Heartbreak and doubt are two vital factors that fuel Simonds to play his best basketball. He said opposing team coaches, students and fans would be on top of him constantly during every game, waiting for him to mess up. The more attention he got around the country, the worse the taunting got. Simonds responded to his hecklers by improving all of his senior season statistics in points, rebounds, and assists. One undeniable characteristic about Simonds is that he’s confident. The 19-year-old mixed shootaround in with dunk attempts that he’s successfully completed and uploaded to social media all summer. 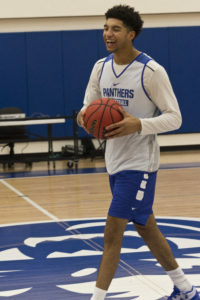 He believes he’s the best freshman in the Sun Belt “by far” and he doesn’t feel the pressure of living up to the shadow of former Panther “Diaper Dandy” and eventual program all-time leading scorer R.J. Hunter. You can tell by the frequent smiling he has, simply by being with his teammates on the floor, that he’s enjoying his current opportunity. Many of his high school critics misunderstood Simonds’ confidence for arrogance, but he said those critics didn’t know him personally and that his family often reminds him to stay humble. Before Simonds can get the chance to become a professional basketball player, he has to find minutes this season in a crowded backcourt. This year’s Panthers will include guards Devin Mitchell, Justin Seymour, Austin Donaldson, Jeff Thomas, Carter Cagle, Nile Felton, one of Simonds’ closest friends in Isaiah Williams and his favorite player in Isaiah Dennis. All of those teammates have battled against each other for the past few months in the four walls of the new practice facility off Decatur Street. The former competitive swimming and diving pool is now almost a mirror image reflection of the GSU Sports Arena, all the way down to the “Welcome to Atlanta” banners that hang behind each backboard. The team is also in apparel transition, with every athlete sporting Under Armour shoes and mostly Under Armour socks to go along with the usual Nike practice jersey and shorts. Moving to Downtown Atlanta shortly after his high school graduation this summer, Simonds anxiousness to begin the season continued to grow by the day. He even tweeted about how excited he was to play defense against USC Aiken in an exhibition game. After spending four years in high school as the tallest player on the floor most nights, the 6-foot-3 guard is now entering the utopia where most defenders will be just as big, if not bigger, than him on a nightly basis. Simonds said that Head Coach Ron Hunter’s best advice to him was to think about making “hit singles.” The phrase is a comparison to the process of making hit song versus playing on the court, because a lot of “hit singles” come when the artist not forcing the issue, and in Simonds’ case, allowing the game to come to him. In the first exhibition of the season, Simonds came off the bench to play the second most minutes out of all Panthers on the night. He ended up scoring 12 points to go along with four rebounds, four assists, three steals and an acrobatic block that brought most fans, who previously pronounced his last name wrong in chants before being corrected by Simonds himself in mid-play action, to their feet.